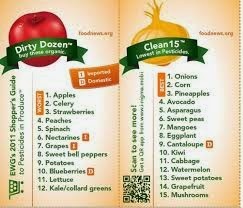 I'm sure you've all heard about the Dirty Dozen and the Clean 15 before. Busy Mama is here for you to help you make informed choices about the produce you buy. If this is the first time you're hearing about the Dirty Dozen and the Clean 15, let me give you a quick lesson. The Dirty Dozen and the Clean 15 list refers to the fruits and vegetables containing the most and least amount of pesticides according to the Environmental Working Group. It is recommended that you buy organic food when it comes to the dirty dozen to avoid eating fruits and vegetables containing very high amounts of pesticides. I think we can all agree that over the past several years, many of us have become very health conscious, especially when it comes to our kids. We try to cook and eat healthier, and that means less or no junk food and going all organic (if we can afford it). Why should you care? Pesticides are toxic and according to many studies and scientific evidence, they have been linked to various health problems, including cancer and hormone disruption. So, if you can, you may want to continue reading. The American Academy of Pediatrics issued an important report in 2012 saying that "children have unique susceptibilities to pesticide residues' potential toxicity". Furthermore, research on this subject insists on a strong correlation between pesticide exposures in early life and "pediatric cancers, decreased cognitive function, and behavioral problems". If you cannot afford buying organic fruits and vegetables when it comes to the dirty dozen, I recommend peeling all fruits and veggies to avoid the pesticides. This list highlights the dirtiest conventionally raised fruits and vegetables. The Dirty Dozen Plus list is an expanded category that includes Leafy greens - kale and collard greens - and hot peppers, known to contain trace levels of highly hazardous pesticides. 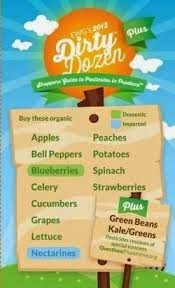 These foods do not meet the criteria of the Dirty Dozen list, but it is recommended that you buy these organic. 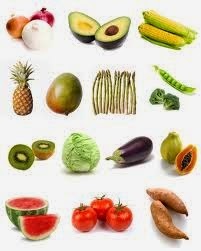 This list highlights the cleanest conventionally raised fruits and vegetables. In 2014, only 5.5% of Clean 15 fruits and vegetables had two or more pesticide. Even though apples rank #1 in pesticide residue, apple juice ranks low... I peel all my apples, as we mostly buy non-organic apples. Peel all fruits and vegetables with high residue levels. Wash your fruits and vegetables well - for grapes, strawberries, green beans, and leafy vegetables, swirl the foods in a dilute solution of dish detergent and water at room temperature for 5-10 seconds, then rinse with slightly warm water; for the other fruits and vegetables, use a soft brush to scrub the food with the solution for 5-10 seconds, then rinse again with warm water. Remember, not all residue can be washed off. Grow your own, if you can - my husband grows tomatoes, peppers, lettuce, and many other veggies in our small backyard in the summer. Canned peaches are shown to have much less residue levels than fresh peaches. Some fruits and vegetables pesticide residue amounts may vary depending on the countries from where they come. For instance, US is known to carry the most contaminated cherries. Canning or freezing fruits and vegetables is known to remove or destroy about 80-90% pesticide residues (and probably vitamins as well). Stay tuned for my next story on why you should (or not) eat organic, and what are the costs associated with it! Disclaimer: This post was written by Stella V.